What do our customers and paddlers think? 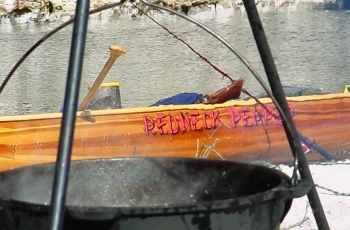 We often hear from them with great stories and pictures of our canoes in action. I have taken this canoe on several solo wilderness trips, where we encountered both a bull moose and a wolf pack (neither could figure out what type of animal I was with a canoe on my head! ), taken on Class III rapids and a 6' waterfall, paddled with dolphins and a 9' crocodile. Along the way we've had some bumps and scrapes but no real damage in 13 years. This canoe has been fast, stable and so easy to maneuver. She'll heel over right to the rail and stop, and I can pivot in a space the length of the canoe. So quiet on the water and a joy to look at while paddling. 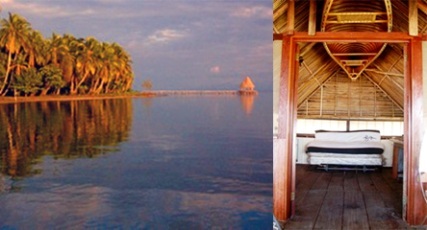 Photo of my American Traders 16' "Trader" hanging above my bed in our cabin on the beach on Cayo de Agua, Panama. My American Traders 'Sliver' has taken me everywhere I have ever wanted to go, by myself, with my dog, or with my dog and mate. 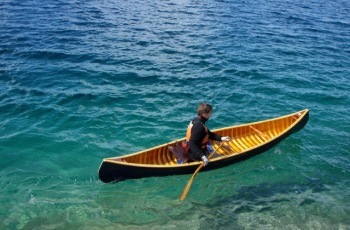 Her figure paddles equally well for a trip across a Lake Michigan bay to the post office, as she does for a paddle and portage in the Canadian wilds. Always on point, forever silent, steeped in tradition and drooling with functionality. I've seen jaws drop at her entrance. She is all the wood boat I'll ever need. Thank you AT. Keep on building them! Sadly, Dave passed away in April 2012. We miss him. My American Traders Algonquin is red cedar covered by canvas. What makes this boat so wonderful is its ability to handle any and all conditions with such ease and grace. - There are faster canoes, lighter canoes, less expensive canoes but I don't think there is another canoe that has met my paddling needs so well. Whether I'm on Lake Superior, Lake Michigan, running down a Canadian River, or exploring the backwaters, creeks, and streams of Southern Wisconsin it is simply perfect. It all started with our love for great food and canoeing the Historical Suwannee River. One Cold November morning at daybreak we shoved off of the white sandy shores at Spirit of the Suwannee Music Park in our canoes. Later that day when we found our camp, my father in law Bob set up his Dutch oven on a tripod and started cooking a pot of Chili. He did not add his usual spices while cooking due to the fact that I could not handle his “Colon Cleansing Chili” as he called it. So he made it mild enough for the “Sissies in camp”. As he dished out his bowl he told me that he had brought a little something to heat his bowl up. He had dehydrated a few peppers and ground them into a coarse blend and placed them into a glass shaker. Of course I didn’t want to be the sissy in camp so I added a little to my chili. It was instant! The flavor became so intense! I could not believe that it changed the taste so much! I sat there and looked at the jar in amazement. I looked at Bobby Luv and said “We should market this” Of coarse he and the others thought I had lost my mind at first. However within minutes we had the entire concept done, the name, logo and the slogan. 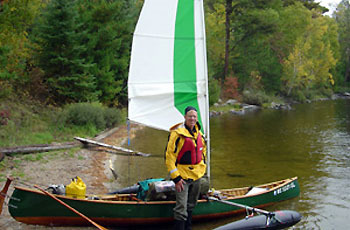 Heidi & Paul Mumm from Wisconsin on a canoe trip in North Western Ontario, Canada. 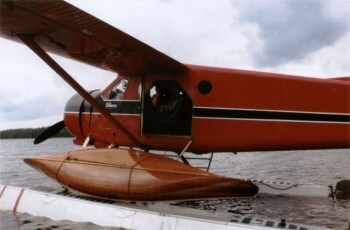 Their 16ft Trader strapped to the floats as they fly into the Wabakimi wilderness region. Wabakimi provincial park is home of the elusive woodland caribou, and renowned for its high quality fly-in fishing and hunting, it is one of the world's largest Boreal Forest reserves and wilderness canoeing areas. This is first class tripping!